Stereo card of the view from the top of St. Regis Mountain. Photograph by Seneca Ray Stoddard. Caption: "Paul Smith's From St. Regis Mountain." 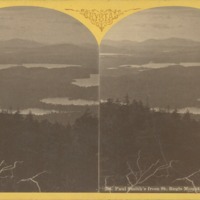 “Stereo Card of View from St. Regis Mountain,” Paul Smith's College Historical Photographs, accessed April 22, 2019, http://archivesphotos.paulsmiths.edu/items/show/2128.